Semele Cavnow appraises antiquities for an exclusive Manhattan auction house, deciphering ancient texts—and when she discovers a manuscript written in the time of Cleopatra, she knows it will be the find of her career. Its author tells the story of a priceless tarot deck, now lost to history, but as Semele delves further, she realizes the manuscript is more than it seems. Both a memoir and a prophecy, it appears to be the work of a powerful seer, describing devastating wars and natural disasters in detail thousands of years before they occurred. The more she reads, the more the manuscript begins to affect Semele’s life. But what happened to the tarot deck? As the mystery of her connection to its story deepens, Semele can’t shake the feeling that she’s being followed. Only one person can help her make sense of it all: her client, Theo Bossard. Yet Theo is arrogant and elusive, concealing secrets of his own, and there’s more to Semele’s desire to speak with him than she would like to admit. Can Semele even trust him? The auction date is swiftly approaching, and someone wants to interfere—someone who knows the cards exist, and that the Bossard manuscript is tied to her. Semele realizes it’s up to her to stop them: the manuscript holds the key to a two-thousand-year-old secret, a secret someone will do anything to possess. The Fortune Teller is an enchanting tale of ancient manuscripts and forgotten relics. It spans over thousands of years covering several lifetimes and takes place across multiple countries crossing borders and oceans. Gwendolyn Womack has masterfully woven a compelling tale of mystery and secrets interlaced around major historical events through time and place, ranging from 46 BC Alexandria, Egypt to the present day New York. Semele Cavnow works for a prestigious New York auction house as an antique appraiser. While preparing for an upcoming auction from a client’s personal collection in Switzerland, she discovers a rare and ancient manuscript. Digging further, she realizes that this extraordinary manuscript which is part memoir and part prophecy is unknown to the world. Its author Ionna, is a two thousand year old, powerful seer who has in great detail and precision narrated events in her future that we’ve known and read as our world’s history. While Semele is trying to unearth the mystery behind this mystic manuscript, someone is keeping an eye on her. Her hotel room gets almost burglarized and there is a man following her everywhere. Things start getting tense when these priceless manuscripts get stolen from her high security company office in New York and she is abruptly taken off the case. What is the secret hidden within this ancient manuscript? Why is someone so desperate to possess them? How does this all connect to Semele’s life? How can a two thousand year old seer acknowledges Semele by name in her writings? Are these mere coincidences or is there a deep hidden mystery beneath it all? 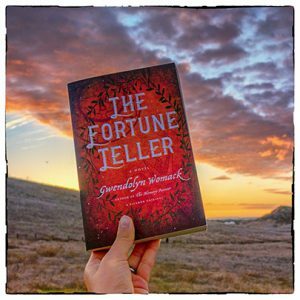 The Fortune Teller is a gripping and an absolutely fascinating tale. I was completely lost in Semele’s and Ionna’s story. The back and forth of the dual point of view works brilliantly for the story. At one end Semele is trying to figure out the mysteries within the mysterious manuscript and on the other end Ionna narrates her story and the future she sees through the years within the manuscript. There is a slight paranormal touch to the story, but I felt it was seamlessly blended with the plot. Alongside there is plenty of classical reference, historical events and also a wisp of romance. This was unputdownable. I thoroughly enjoyed this wonderful story of secrets, mysteries and family ties that span over centuries and would highly recommend it if you enjoy thought provoking mysteries with historical references.